Sunday is my blogging day, as I like to keep Saturday open for other fun activities such as cleaning my room, photographing little toddlers, bathing Ellie, and losing in a game of chess. This past weekend, I found myself in a little rut. Stress and pressure have been whacking my brain with what feels like a baseball bat of cortisol. I am more than just eager to wrap up job interviews and apartment hunting. I have also been suffering from reoccurring dreams of ending up in jail (I have got to stop watching Orange is the New Black before bed). I didn’t want to let the stress consume me, so I visited my sanctuary – the kitchen. 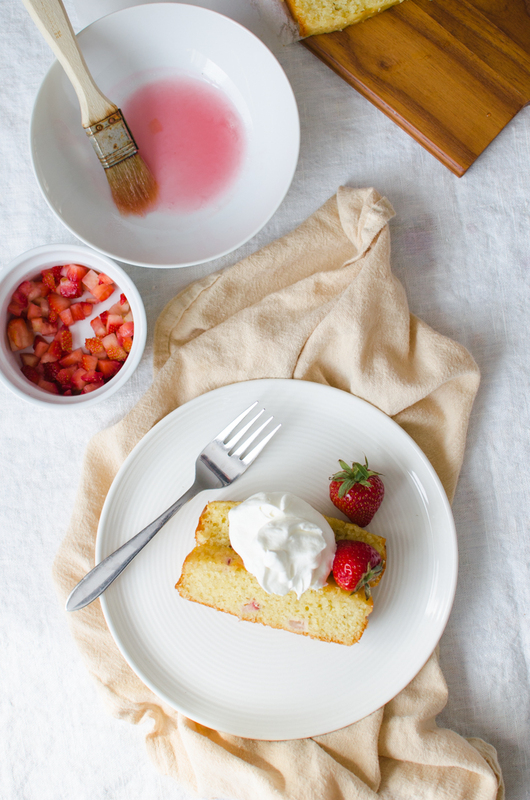 And I couldn’t pass up making something with all the gorgeous rhubarb and strawberries that are in season. I was in the mood for something sweet and simple, and I immediately thought of Cynthia’s Chamomile Lemon Poppy Seed Loaf Cake. 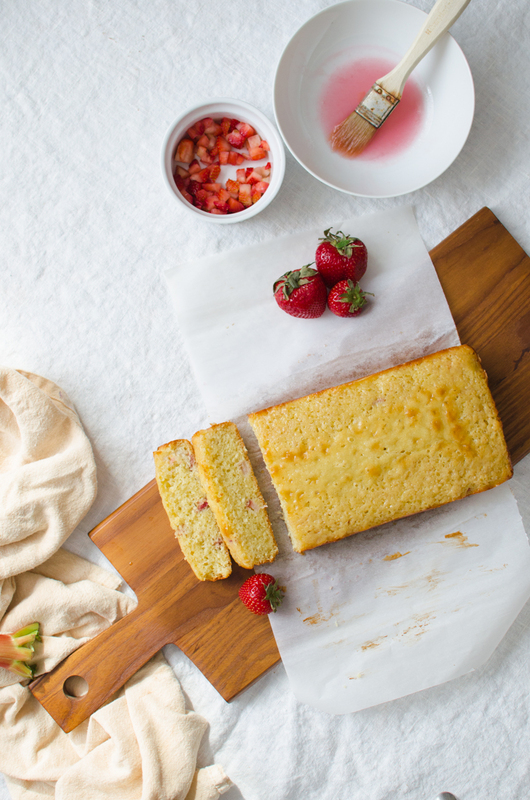 I adapted my recipe for this perfectly moist strawberry rhubarb loaf cake from Cynthia’s loaf cake, which I’m sure is my dessert soulmate. 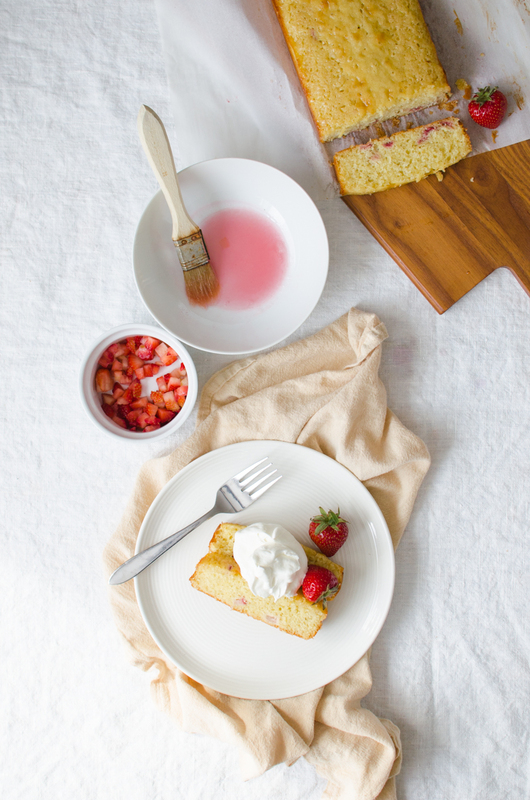 This loaf cake is made with petite diced strawberries and rhubarb syrup. 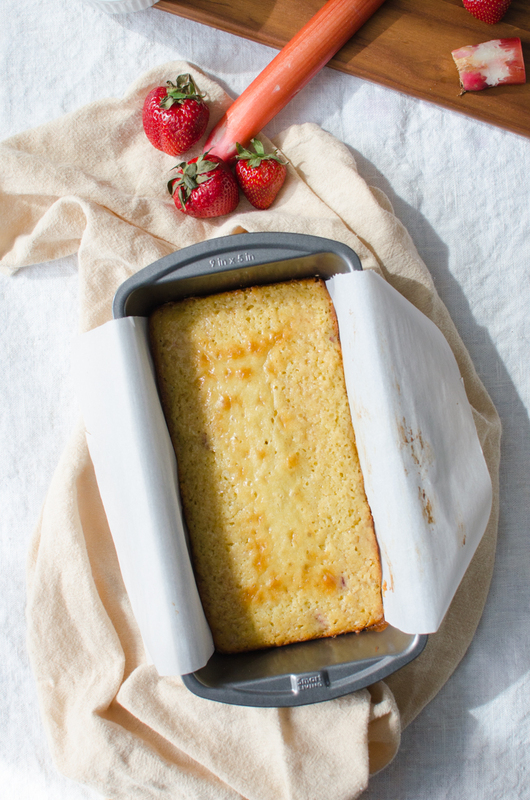 It’s baked in a bread tin, so it’s essentially cake disguised as bread. Several slices and dollops of whipped cream later, I felt like my old and cheery self. 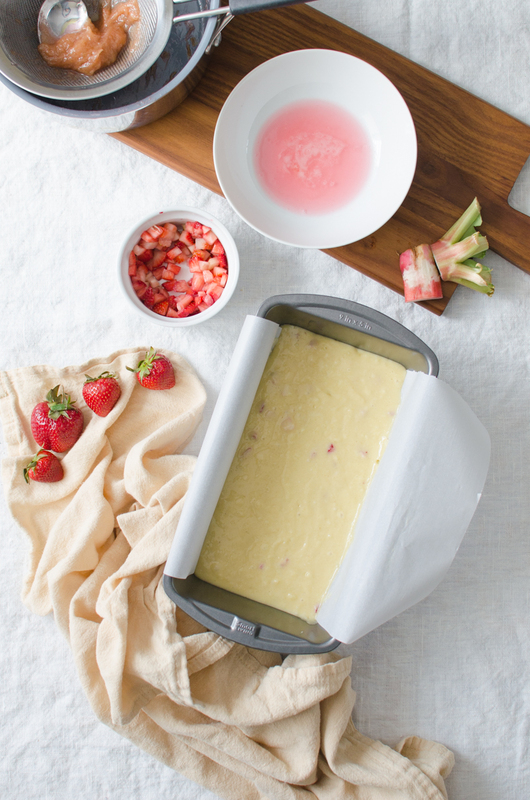 Who knew strawberries and rhubarb had magical powers? In a small bowl, whisk together the yogurt, milk, and strawberries. In a large mixing bowl bowl (use a stand mixer if you have one available), mix the sugar, butter, and oil until smooth. Add the eggs, one a time, and the rhubarb syrup. With an offset spatula or spoon, slowly fold in ⅓ of the dry mixture followed by ⅓ yogurt mixture to the butter mixture. Repeat, and fold until just combined. Line an 9x5 loaf tin or dish with parchment paper. Pour the batter in, then bake for 35 minutes, until golden brown and a toothpick inserted comes out clean. Remove the loaf from the oven and allow it to cool for 10 minutes on a wired rack. Brush the top with the remaining rhubarb syrup. 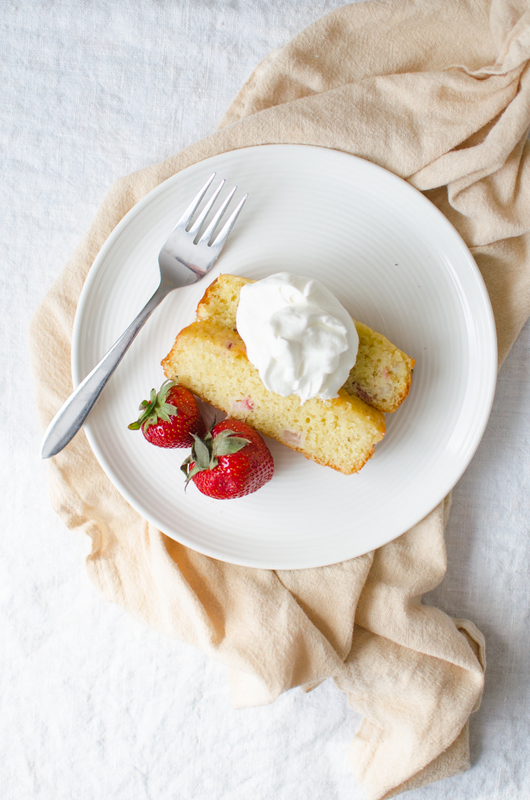 Serve with fresh whipped cream. Combine all the ingredients in a medium saucepan and bring to a boil. Reduce the heat to low and simmer until it thickens slightly, about 20 minutes. Stir occasionally. Strain the syrup through a sieve over a bowl, and discard the rhubarb. If you're not using it right away, cover and refrigerate. Whip the heavy cream with an electric mixer on medium-high speed. When it begins to thicken, slowly add the sugar and reduce the speed to medium. 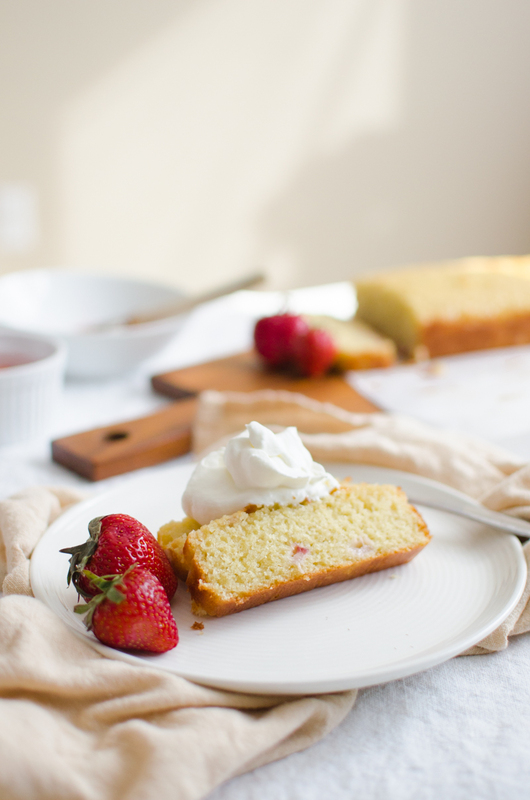 Continue to whip the cream, until peaks form. Serve with slices of loaf cake. This entry was posted in Breakfast, Desserts & Sweets and tagged bread, cake, greek yogurt, rhubarb, strawberry. This is lovely and sounds delicious. I love rhubarb and strawberries. Maybe it will be the first cake in my new oven! I am looking forward to doing some actual cooking/baking again.